How do I connect Authorize.net to WebReserv? If you have are using Authorize.net as your payment gateway, you can add the integration to your WebReserv account easily. In your WebReserv account, navigate to Setup - Business Information - Payments. 1. 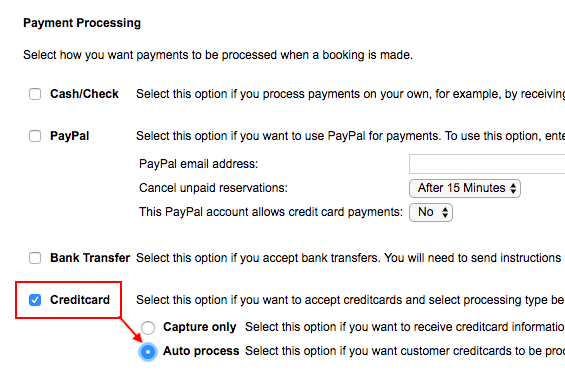 In the Payment Processing section, select the checkbox for Creditcard - Autoprocess. 2. in the Accepted Credit Card section, select the card types that you will accept (e.g. Visa, MC, Amex). 3. In the Advanced Options section, select the setting choices that apply. Default options are indicated as the most common settings. Next, in the Payment Gateway section, select Authorize.net from the drop down menu. Here you will enter the API Login and Transaction Key from your Authorize.net account. After you add the information, save your changes by clicking Save and continue at the bottom of the page. That's it! You've successfully setup the integration with Authorize.net. Next, to ensure the setup was done correctly, you should enter a test transaction.